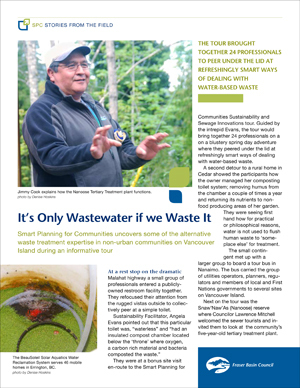 24 professionals embarked on a Vancouver Island tour to explore alternative wastewater treatment options in non-urban communities. All agreed that a day spent peering under the lid proved inspirational. At a rest stop on the dramatic Malahat highway a small group of professionals entered a publicly-owned restroom facility together. They refocused their attention from the rugged vistas outside to collectively peer at a simple toilet. Sustainability Facilitator, Angela Evans pointed out that this particular toilet was, “waterless” and “had an insulated compost chamber located below the ‘throne’ where oxygen, a carbon-rich material and bacteria composted the waste.” They were at a bonus stop en route to the Smart Planning for Communities Sustainability & Sewage Innovations tour. Guided by the intrepid Evans, the tour would bring together 24 professionals on a on a blustery spring day adventure where they peered under the lid at refreshingly smart ways of dealing with water-based waste. Another bonus stop at a rural home in Cedar showed the participants how the owner managed her composting toilet system: removing humus from the chamber a couple of times a year and returning its nutrients to non-food producing areas of her garden. They were seeing first hand how for practical or philosophical reasons, water is not used to flush human waste to "someplace else" for treatment. The small contingent met up with a larger group to board a tour bus in Nanaimo. The bus carried the group of utilities operators, planners, regulators and members of local and First Nations governments to several sites on Vancouver Island. 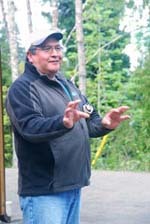 They carried on to the Snaw’Naw’As (Nanoose ) reserve where Councillor Lawrence Mitchell welcomed the sewer tourists and invited them to look at the community’s five-year-old tertiary treatment plant. Snaw’Naw’As members Jimmy Cook and Trisha Pentell navigated the group through the compact and low-rise cedar buildings. They explained how the plant treated wastewater to some of the highest levels along the Coast. “This is a sewage plant?” someone commented to operators looking around at the clean odourless facility. Before the plant was built there were health issues arising from sewage contaminating Nanoose Bay resulting in a shellfish harvesting ban. The well-kept station replaced the old failing septic systems with collection pipes, a pump station, the treatment facility and 2.2 km ocean outfall. Construction of the Nanoose plant fixed a messy problem and eradicated many health risks stemming from the original system. Had the new treatment method not been installed, there would likely be an expansion of the shellfish gathering closure at some point in the future, affecting high value clam harvest areas fronting the reserve. As they departed, tour participant Helen Reid, Cowichan Tribes Referral Coordinator, said, “We could look at whether we could do this in our bay — it’s really inspiring." Back on the bus, conversation flowed among the diverse group. They all shared an interest in sustainable systems and how to manage sewage in non-urban areas in a way that was affordable, healthy and protected the environment. 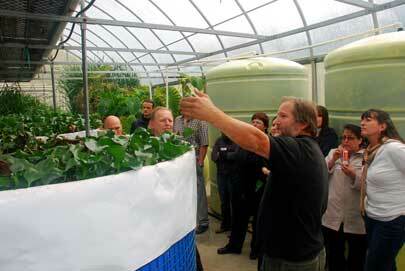 The next tour stop was another opportunity to discover alternatives to conventional sewage treatment. The bus parked outside a large greenhouse in the town of Errington where the troupe ducked through patches of rain to reach the translucent, oblong structure. Inside the air held a rich, moist earthy scent reminiscent of a tropical garden — which it was in some respects — as exotic plants grew vigorously along with duckweed and aquatic pond plants, herbs and flowers in cement containers and portly plastic tubs. These were part of the BeauSoleil Solar Aquatics Water Reclamation System that serves 46 mobile homes nearby. 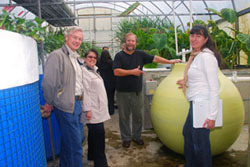 The system replicates the natural cleansing abilities of wetland processes through several stages. There are no chemicals and it is a much slower process than a conventional plant but, after 14 years, still meets Provincial treatment standards. Tour participant Jodie Dong, a senior planner for the Province with a specialty knowledge of making resources out of waste commented, “I’ve never seen that before, it’s very new and different and they do it at a very low cost using plants to treat sewage in a small development — it’s eco friendly, low tech and low energy.” They could have lingered in the tropical warmth but there was one more intriguing site to visit. The final tour stop was in the community of Saltair where the group met with inventor and applied wetland scientist Curt Kerns outside two private homes. The homeowners had replaced failed septic fields with new systems. The systems were a combination of three elements; a septic tank, a Nyadic secondary treatment aeration plant and Kerns’ invention: the Vegetative Tertiary Filter type III (VTF). The VTF uses peat, hog fuel and plants that help create topsoil. Typically, primary treatment fields are on large, flat raised areas. Installers sternly warn against planting anything on these fields other than grass since tree roots interfere with the drainage pipes. In short, a raised septic field looks like a septic field and it’s embarrassingly difficult to hide the fact. Kerns first developed the VTF as an alternative to unsightly sand mounds on challenging sites. Relying on the huge surface area of peat moss, VTF systems are designed to remove trace contaminants such as endocrine disrupting compounds, pharmaceuticals and personal care products, preventing them from entering the water table or surface waters. The group was particularly fascinated with the dispersal area. Landscaped with plants and a colourful flowerbed, thanks to the talents of the homeowner, it was indistinguishable from a garden bed. “It looks like any other small suburban front lawn,” remarked one tour participant. “This solution would work really well on Reserve, it’s an incredible solution for a major problem we have throughout the community,” remarked another. "It was one of the best tours I’ve ever been on."